Some time ago we installed “solar thermal” on our roof, as described in: “The Dorothy Hopkinson Memorial Solar Panel”. This heats water, it’s significantly reduced our gas usage over the summer when the central heating is not on but during the winter when most of our gas is consumed the effect is minimal. Next step on the renewable energy list is solar photovoltaic (PV) – this converts light to electricity directly. Solar PV systems are rather more expensive than solar thermal systems, until recently the economics of this were a bit questionable – £10,000 is a lot to spend to reduce your electricity consumption by half. However, the feed-in tariff scheme was introduced in the UK in April 2010. This scheme pays a generous tariff based on the total amount of renewable electricity generated by an installation in an effort to increase the uptake of such systems. A similar scheme has been in place in Germany since 2000, where it has been pretty successful in reaching this goal. We have a medium-sized 3 bed semi-detached house with East-West facing roof elements which are relatively small. Two of us live in the house, our annual electricity consumption is typically 6.5 kWh per day or 2400kWh per year (*see below for a comment on units). When we first moved into the house our consumption was around 11kWh per day (4000kWh per year). We reduced this by replacing all our light bulbs with low energy versions; switching off a second fridge/freezer; almost entirely stopping using a tumble drier and on replacing fridges and washing machines we bought the lowest energy versions we could find. So these measure achieved roughly 40% reduction. I know all this because I’ve been recording our electricity and gas consumption once a week for the last 3 years! A colleague at work has recently installed both solar thermal and solar PV, and he gave a talk describing his experiences. After some delay we arranged for a survey by The Green Electrician, who were the installers recommended locally by Segen. The surveyor did a few measurements of our roof and then went through sample power generation calculations and costings based on those measurements. The calculation is described in “The Government’s Standard Assessment Procedure for Energy Rating of Dwellings” (SAP 2005 page 69). Beforehand I was under the impression that this wasn’t going to be worthwhile since only our East-facing roof is available for installation and this is always described as ‘non-ideal’. However, the calculations show that the penalty for an East-facing roof compared to a south-facing one is only about 15%. Unlike solar thermal, direct sunlight is not required – useful energy is still generated on a cloudy day or when the panel is in shadow. Slight diversion: we were original quoted for an 8 panel system, however once on the roof the installers found they could fit two more panels. I’ve redone the calculations to allow for this – they may be a little bit inaccurate but not much. The system recommended was a 1.85kWp Suntech system (ten 1580 x 808mm panels = 12.64m2) limited by the size of our roof. The calculated output of this system is 1393kWh per year i.e. about 60% of our annual usage. The price quoted for this system is ~£8,600 (excluding cost of scaffolding which was just over £400). The feed-in tariff is £575 per year based on 1393kwH per year production at a price of 41.3p per kWh. The savings on our electricity bill should be £98 per year (based on 50% of generated electricity being used by us at 14p per Kwh) and £21 based on selling the other 50% back to the grid at 3p per kWh. The feed-in tariff is inflation linked, and it’s reasonable to assume that the buy and sell prices of electricity will go up in the future. As you can see the feed-in tariff is what makes this financially sensible. In theory we will be getting £694 back on the system every year, so it will pay for itself in 13 years or less, mainly due to the feed-in tariff. The tariff is paid for 25 years so at the end of 25 years we will have been “re-paid” at least £8350 more than we spent. This is an embarrassingly high “middle-class benefit”. There are companies who will install renewable systems, paying the upfront costs, providing significantly cheaper electricity and taking the tariff (see Guardian article here): in summary this could work for you but the companies aren’t doing you a favour. Installation is pretty straightforward: we needed substantial scaffolding across the front of the house to provide roof access; there’s some electrical gear to go in the loft (this is a panel about 1m2) and there’s a cable run from there down to our consumer unit under the stairs where there is a further small meter the size of a central heating controller. In our house this is fairly straightforward: the cable runs up to the loft via ducting up the stairwell – we’ll bury this in the wall when we next decorate. Three chaps were working for a substantial fraction of two days but they also cleaned out my gutter and re-pointed the ridge-tiles. At this point I’d like to commend Ian, Danny and John: the installers, who did a fine job and were most polite. There’s still some paperwork for us to do, but essentially the power companies are obliged to pay the feed-in tariff and accept energy back from us onto the grid. At the moment I’m going up and down the loft stairs to look at my power generation at 30 minute intervals! Overall I’m very pleased with the system: survey to installation was a day under 3 weeks and on a not particularly sunny day I’ve been generating 1000W since 10:30am and peaked at around 1500W. As of 3pm I’ve generated 4.4Kwh which is nearly 70% of our average daily usage. We expect to get less electricity from the system as we head into the shorter days of winter with a sun lower in the sky, but it’s not a bad start. As an additional bonus we can now electrocute unsuspecting electricians in a sustainable fashion – unlike a normal house you need to switch off supply from the grid and from the solar panel before sticking your screwdriver anywhere electrical. There are big signs to this effect next to the consumer unit. *Note on units: Power is the rate at which something consumes energy, and the units for this are Watts (W), 1000 Watts is known as 1kiloWatt (kW) – a kettle uses about 2kW when it is running, the PC I’m using about 300W and the electric shower about 9kW. Ultimately what you buy from the electricity company is an amount of energy. For domestic electricity consumption we talk about “kWh” or “kilowatt-hours” this is a power multiplied by a time which in physical terms is “energy” which physicists would normally quote in units of “Joules” however, we’re not in physics at the moment. The quoted output of our system is in “kWp” or “Kilowatt-hours (peak)” – this is the maximum power we could possibly obtain from the system. Some pictures of the system, including a graph of gas and electricity consumption over the last three years. This post is in memory of my paternal grandmother: Dorothy Hopkinson. This isn’t going to be a maudlin post: granny died about 18 months ago at a fair old age. I remember her for her cheery smile, ultra-competitive playing of cards and Scrabble (whilst simultaneously claiming to be unconcerned by the outcome), her white drop-handlebar bike which she rode into her sixties, spectacles at a jaunty angle as she slept: snoring in front of the TV, icecream made from evaporated milk in battered aluminium dishes and nettle soup. When she died she left some money which I used to buy a direct water heating solar panel which I have christened “The Dorothy Hopkinson Memorial Solar Panel”. I have, of course, been recording my gas and electric readings every Saturday morning for the last couple of years. Okay, I appreciate most people don’t consider this “natural” but it isn’t hurting anyone and it does give me some nice numbers to play with. Obsessive data collection has a fine track record in science: Tycho Brahe for example spent years collecting data on planetary orbits, Nevil Maskelyne collected data for determining the longitude from the location of the moon, J.D. Bernal’s poor lab technician spent what must have been an incredible amount of time fishing balls out of a bag, recording their exact location as he went (that’s more data collection by proxy) (these are just the ones I can remember off the top of my head). Of course computers and electronics have meant that a lot of data collection can be automated but there’s still a place for a bit of tedious manual data collection in the modern lab (or home). Feel free to add to tales of heroic data collection in the comments. I give the gas and electricity numbers to a little program I wrote in C# (a relatively new programming language), which plots them out. I used C# as a little exercise to get me using the language – normally I use Matlab (which is a language environment more suited to scientific programming). Making graphs with numbers comes very naturally to me, and I find it very easy to read a graph. But I observe when we go walking that I’m much happier reading an OS map than my wife who prefers words in a guide book – so I’m not sure everyone reads a graph in the way I do. Perhaps you’d like to comment? So in the graph above, time runs along the bottom axis from left to right, the gas used in a week runs in the vertical direction. The mountainous bits are the winters, when the central heating is switched on. The relatively flat bits in between are the summers. First thing that strikes you is that the amount of gas used for central heating in the winter is huge (about ten times more) compared to the amount used just to heat water, during the summer. 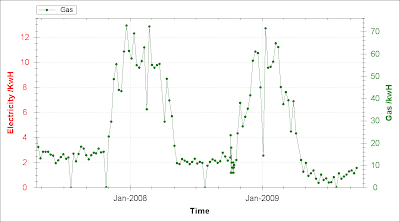 The solar panel was installed in September 2008 (almost a year ago), over the winter it probably had relatively little effect, although looking at the raw numbers gas usage over Winter 2008/09 was about 20% lower than Winter 2007/8 despite this year being a colder winter. This is probably due to the improved insulation installed at the same time, we went from about 10cm thickness to about 25cm thickness. In the summer the reduction in gas usage is pretty large – down by 55%. Through this summer you can see that the gas usage drops gently to a minimum around June, this is due to the increasing height of the sun in the sky and the lengthening day. Was the panel worth it? Well, it is quite exciting seeing your water getting heated for “free”, and during the summer months (even a relatively poor summer) we used a lot less gas. In financial terms the payback time for us is very long, although with a larger household and larger hot water tank the pay-off time would be reasonable (i.e. <10 years). Personally, I think the financial argument is missing the point, if we only change our behaviour for short term financial benefit we will all steam, gently over the next 100 years or so.